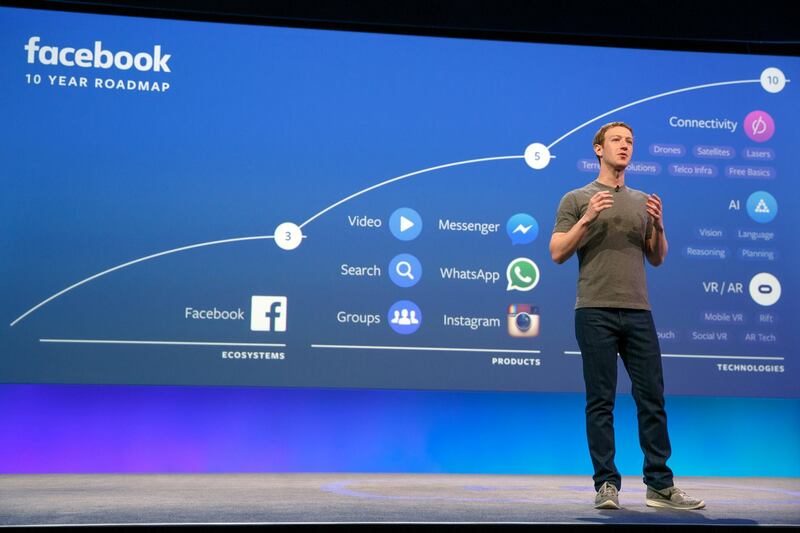 The billionaire behind the world's biggest social network, Mark Zuckerberg, has been the target of online hackers. 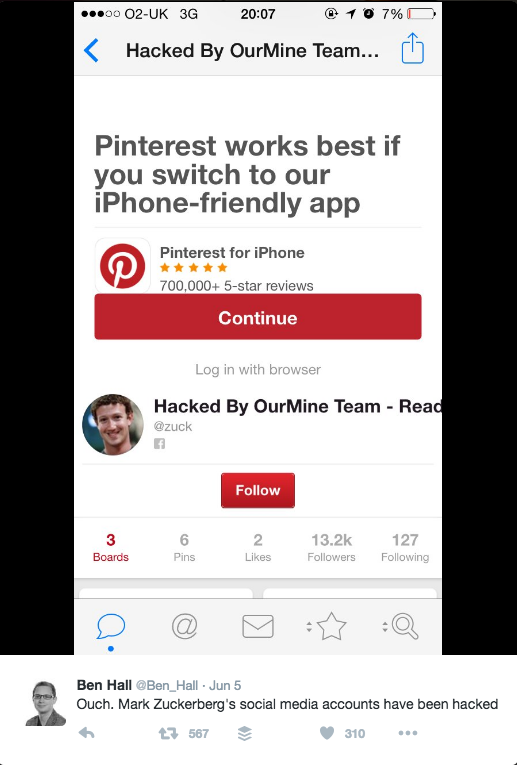 The Facebook co-founder and CEO reportedly had his Twitter and Pinterest accounts hacked by a group called OurMine this week, according to the ABC. It made some claims on Mr Zuckerberg's Twitter account, saying it got hold of his password through a LinkedIn data leak, recently. The group stated in a separate post that it also gained access to his Instagram account. Even Mark Zuckerberg can fall victim to online hacking. Photo: Twitter. OurMine had more than 40,000 Twitter followers before its account was suspended. 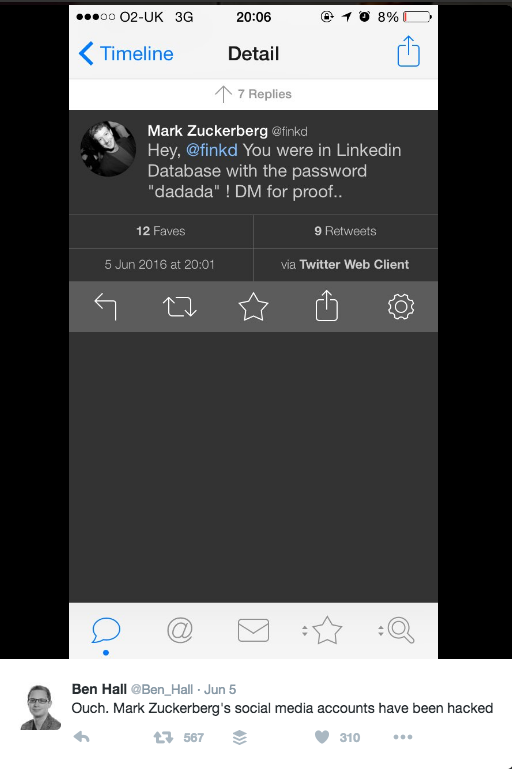 "Hey @finkd, you were in LinkedIn Database with the password 'dadada'! DM (direct message) for proof," OurMine tweeted from Mr Zuckerberg's account on Sunday night (AEST). Before the group hacked into Mr Zuckerberg's accounts, there had been no activity on his Twitter page since January, 2012, while, his Pinterest board was quite the same. The hack went viral with people sharing screenshots of the incident on social media. Apple's rival, Samsung Electronics Co., has been quietly developing two new smartphone models with bendable and flexible displays, behind the scenes, reports say. A report by Bloomberg revealed the devices will use organic light-emitting diodes (OLED) and could be launched as early as February, 2017. Insiders reportedly told the news website that one device would fold in half like a compact-mirror, while, the second Samsung model would boast a 12.5cm screen when in 'handset' mode and unraveled into a screen size of about 20cm, into a tablet. ‍A peek into the not too distant future of phones. Photo: YouTube. “This product could be a game-changer if Samsung successfully comes up with a user interface suitable for bendable screens,” Lee Seung Woo, an analyst at IBK Securities Co. in Seoul, told Bloomberg. However, it is unlikely that Samsung would make these its flagship phones, focusing on more traditional models going forward. Sydney startup Seatfrog will allow a greater number of airline passengers to travel in luxurious comfort and style. 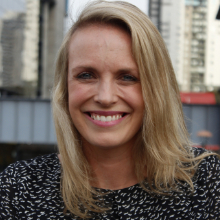 The business, currently in beta, has raised $1.2 million in seed funding and will offer travellers to bid on seating upgrades through an auction, according to Startup Daily. 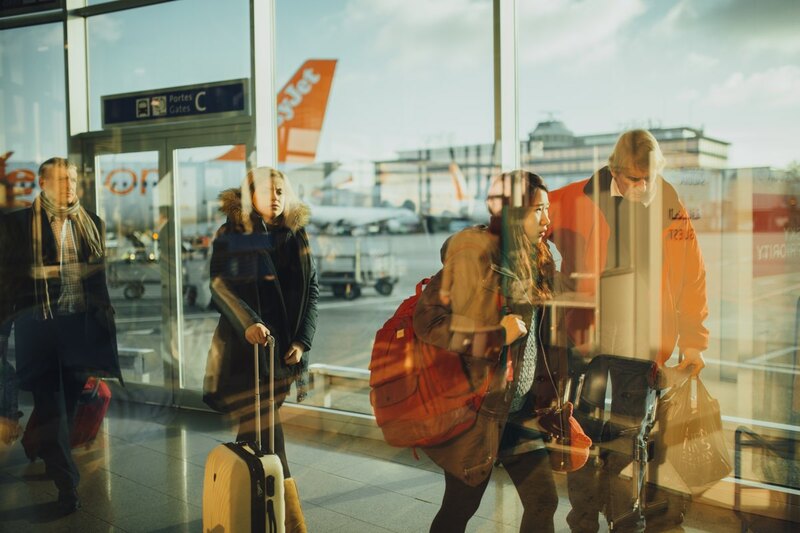 If they score an upgrade, passengers pay for the privilege via the Seatfrog app, which sends a new boarding pass straight to their phone and can be scanned at the departure gate. Passengers will bid at auction for an upgrade. So, what's the benefit for airlines? The Seatfrog app will enable carriers to enjoy "millions of dollars" in revenue that, as the apps founders' said, had been forgotten. “For airlines, ancillaries are currently estimated to be worth around $US60 billion [$A80 billion]," Seatfrog co-founder and CEO Iain Griffin said. "Seatfrog’s technology dramatically broadens the scope of this market opportunity by making upgrades seamless for passengers and maximising efficiency and profit for airlines." 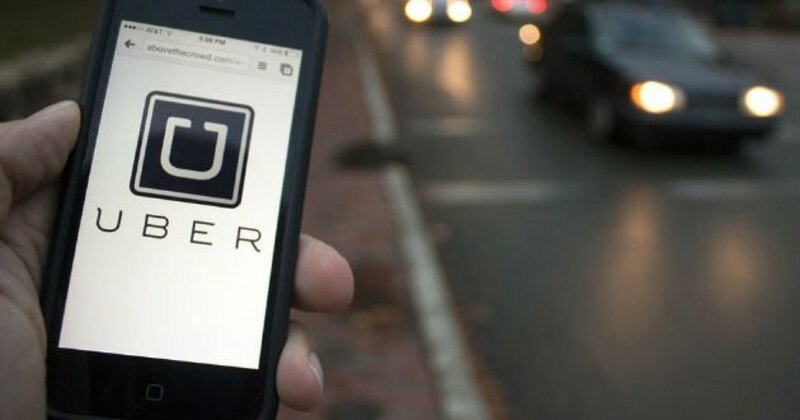 Saudi Arabian women are boycotting transport company Uber Technologies Inc. after a recent investment by their government. The country is governed by a law that bans females from driving. The Saudi women said they were outraged by Uber's $US3.5 billion dollar deal [$A4.6 billion], which came from Saudi's sovereign wealth fund, because it showed the government would profit from the female driving ban as well as them backing the policy, the Financial Review reported. The deal is the country's first step towards investing in other things besides oil. Angered women voiced their concerns on social media, using a hashtag that translated to: 'Saudi women announce Uber boycott'. They also posted photos of themselves cancelling the Uber app from their smartphones. Under the law, Saudi women either rely on male family members to drive them around or pay for chauffeurs. "They're investing in our pain, in our suffering," Saudi women's historian, who teaches at Qatar University, Hatoon al-Fassi, told the Financial Review from Doha. "This institutionalises women's inferiority and dependency, and it turns women into an object of investment." Have a unique idea to create your very own project? Get in touch with the great team at SEED to make an enquiry.